Hibs Ladies turned in a rousing display to dispose of opponents Motherwell 4-0 and remain top of Scottish Building Society SWPL 1. 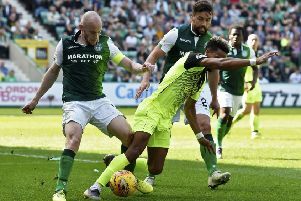 The Hibees were a class above the North Lanarkshire outfit throughout, although it did take them until two minutes before the half-time interval to establish a lead. A terrific run and cross by Jamie-Lee Napier allowed Rachael Small to stab home from close range. Napier then hit the bar ten minutes into the second half before Lauren Davidson doubled the visitors’ advantage at Ravenscraig Sport Complex with a smart finish. Small added a third and her second of the afternoon straight from a corner kick, and Kirsten Reilly kept up her early-season scoring spree with a free kick from just outside the box. Manager Grant Scott said: “I’m delighted that the players got the win they deserved. We knew it would be difficult against this new Motherwell side and all I asked was that the players remain focused and professional and trust each other and the result would come. Spartans crashed to a 5-1 home defeat by Celtic, Michaela McAlonie with a consolation for Debbi McCulloch’s side. In SWPL 2, league leaders Hearts suffered their first defeat of the season as they lost 1-0 to Dundee United.